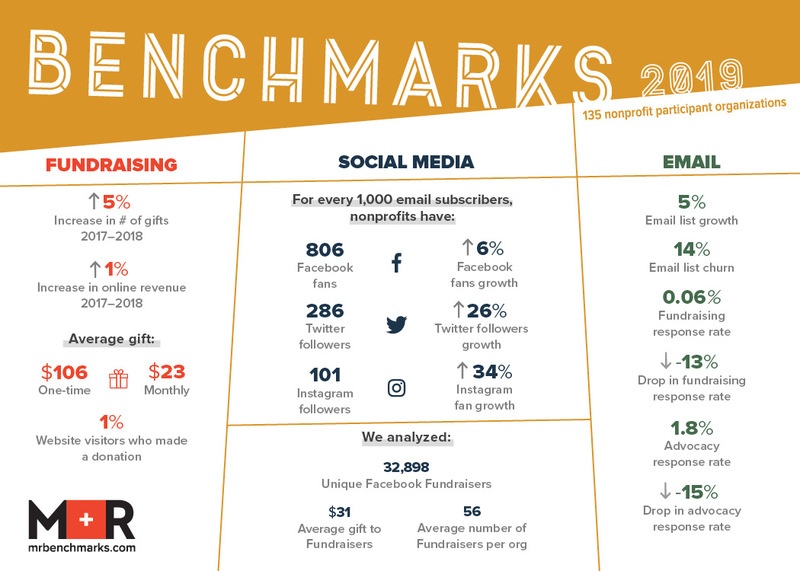 We are just two weeks away from the official release of the 2019 M+R Benchmarks Study. And like the first inquisitive robin arriving to herald the onset of spring, we have some early tidbits of data to share with you now. The truth is, we’re just hella excited and we can’t wait. This year’s Study dives into new metrics for Facebook revenue, peer-to-peer texting programs, and retention. And, as usual, we sift through old metrics like nitty-gritty email messaging and fundraising stats. And we explore the expanding worlds of digital advertising, social media, website performance, advocacy, marketing, and more. We track trends, spot outliers, explore from every vantage point. It’s neat. You’re gonna like it. As promised, here’s a little peek at some of this year’s data. And be sure to sign up to be notified the minute the full Study goes live on April 25! We’re eager to share our perspective and answer all the questions these numbers prompt. Make sure you know the moment Benchmarks is released on April 25 by signing up here. Want to dig even deeper? Join us for our launch day webinar, co-hosted with NTEN. And in case you missed it, we’re partying across the country and we hope you can join us! RSVP for any party here! We’ll send details about our Cambridge location soon!